With some 3 million inhabitants, Maracaibo is the second largest city in Venezuela, and the centre of the country's oil industry. The first stage of L1 of Metro de Maracaibo, has a total length of 6.5 km, running along Don Manuel Belloso, Sabaneta and Libertador avenues. There are 6 stations, 4 at grade and 2 elevated. 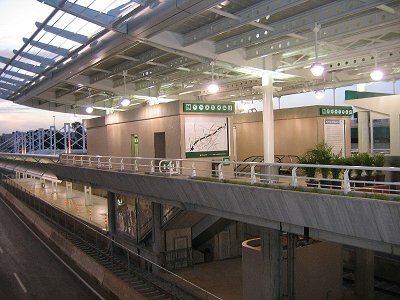 The first station, Altos de la Vanega, is located next to the depot and workshops. From here the route runs at grade towards the city centre with stops at El Varillal, El Guayabal and Sabaneta. 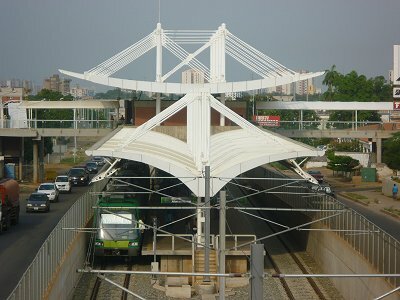 After the latter station, the alignment is on a viaduct including the last two stations Urdaneta and Libertador, the only ones with side platforms, right in the city centre. Trains run every 5 minutes during peak hours and every 6-8 minutes off-peak. The maximum speed is 70 km/h, average travel speed will be at 35 km/h. Current supply is at 750 dc via an overhead wire. Trains were supplied by Siemens, based on class M1 originally designed for the Prague Metro. 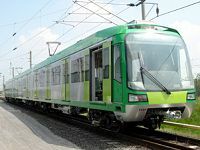 A 3-car trainset is 58.2 m long, and 2.7 m wide. The train floor lies 1150 mm above the rail top. Seven trains were delivered for phase 1. The second stage of metro is under construction, it includes five new stations (Padilla, Falcón, 5 de Julio for L1 and Calle 72, Indio Mara for L2) all of them underground. Once L2 has been completed in a third stage to Curva de Molina, L1 may be extended north from 5 de Julio towards Milagro Norte in a fourth stage. The fifth stage will be L2 running from Curva de Molina to 5 de Julio (8.5 km) and then to El Milagro. L2 will not be completed before 2020.